The story of the Vickers gun is well known. It originated in the first successful self-powered machine gun, the Maxim of 1884, which had become the standard machine gun of the British Army by 1891 and was adopted (under various names) by many other armies. A modified version with a more compact mechanism was adopted by the British Army early in the 20th Century as the Vickers-Maxim but later simply became known as the Vickers. It was available for various rifle cartridges (up to .45 inch or 11.5 mm) but in British service was overwhelmingly used in .303 inch (7.7x56R) calibre. It fought through two world wars and remained in front-line British service until the mid-1950s. Also well known are the big "pom-poms" in 37 mm or 40 mm. The first of these was the Maxim one-pounder (1 pdr) of the late 19th Century in 37x94R calibre, named for the weight of the shell. This was manufactured by Vickers, who went on to develop heavier versions. The first of the these was the 1½ pdr (37x123R) just before the First World War (this was experimentally fitted to the R-31 airship, in a circular top mounting), but shortly afterwards this was replaced by the 2 pdr (40x158R) which became the standard naval AA gun, available in single, four and eight-barrel mountings, serving until after the Second World War. In between these were the .5 inch machine guns, which are much less well known. This account is intended to describe the various experimental and service weapons and their ammunition, developed mainly in the interwar period, some of which saw service but several of which did not. The origin of the .5 inch Vickers goes back to the First World War. It seems that two or three different problems prompted the development of this gun. One was the need to fire bullets large enough to carry a useful incendiary charge to set light to enemy balloons and airships. Some of the rifle-calibre Vickers had been chambered for obsolete rifle cartridges such as the 11 mm Gras in order to achieve this, but a purpose-designed modern cartridge would obviously be better. 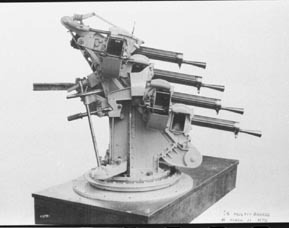 The second was the need for a more hard-hitting machine gun against aircraft, some of which were now being fitted with armour. The third was the development of the tank, which required a better armour-piercing performance than rifle-calibre guns could achieve. Although the German 13 mm Mauser M1918 anti-tank rifle and the associated TuF (Tank und Flieger, after the intended targets) heavy machine gun are now famous, the parallel British developments are not. These were based around a .600/.500 inch cartridge originally derived from an elephant gun round. The anti-tank rifle was the Godsal of 1918, the machine gun was a Vickers. The Godsal disappeared from the scene (although an example has survived) but the cartridge for the machine gun went through various evolutions (included a version with a belted case) until the final form emerged in 1921. This used a rimless 12.7x81 case and was known by Vickers as the .5V/580, after the bullet weight in grains (37.5 grams). Muzzle velocity was around 750 m/s and total cartridge weight 83 g. The ammunition was officially adopted for service in 1924. Ball Mark I.z: 580 grain bullet with two-piece core (front aluminium, rear lead). Approved for service 1924, but not issued. Ball Mark II.z: 580 grain bullet as above, muzzle velocity 2,540 fps (774 m/s). Approved for service 1925. Ball Mark II (cordite propellant): approved for land service 1933. Armour Piercing W. Mark 1.z: bullet with hardened steel core and lead sleeve and tip filler. Approved for service 1925. To pass proof, seven out of ten bullets had to penetrate 18 mm of armour plate at 100 yards range at 0 (90) degrees, and 70% also had to penetrate 14 mm armour striking at 20 (70) degrees. Armour Piercing W. Mark 1 (cordite propellant): as above, approved for land service 1933. Semi Armour Piercing F Mark 1.z: bullet as AP except steel core not hardened. 2,470 fps (753 m/s). Approved for naval use 1938. To pass proof, 70% of bullets had to penetrate 15 mm armour plate at 100 yards and 0 (90) degrees. SAP Tracer FG Mark 1.z, II.z, III.z: bullets weighed 542, 549 and 515 grains respectively (35.1, 35.6, 33.4 g), all at 2,470 fps (753 m/s). They all had a steel core with a tracer cavity drilled in the base, and all traced to 800 yards (730 m); the Mks II and III had a dark trace (i.e. tracer did not illuminate until 100 yards from muzzle). All were approved between 1940 and 1944. All had to achieve the same penetration figure as the SAP F Mk 1.z. Incendiary B Mark I.z: bullet weighed 562 grains (36.4 g) and was similar in design to the .303 inch B Mk. VII (i.e., a simplified "De Wilde"). Within the jacket was a steel sleeve containing 28 grains of incendiary composition with a further 2 grains of QF composition held in the jacket tip. Introduced after 1939. It appears that the AP rounds saw little use since production stopped prior to 1935. The SAP and SAP-T were increasingly used instead, particularly by the RN. This was presumably because they were almost as effective and considerably cheaper. 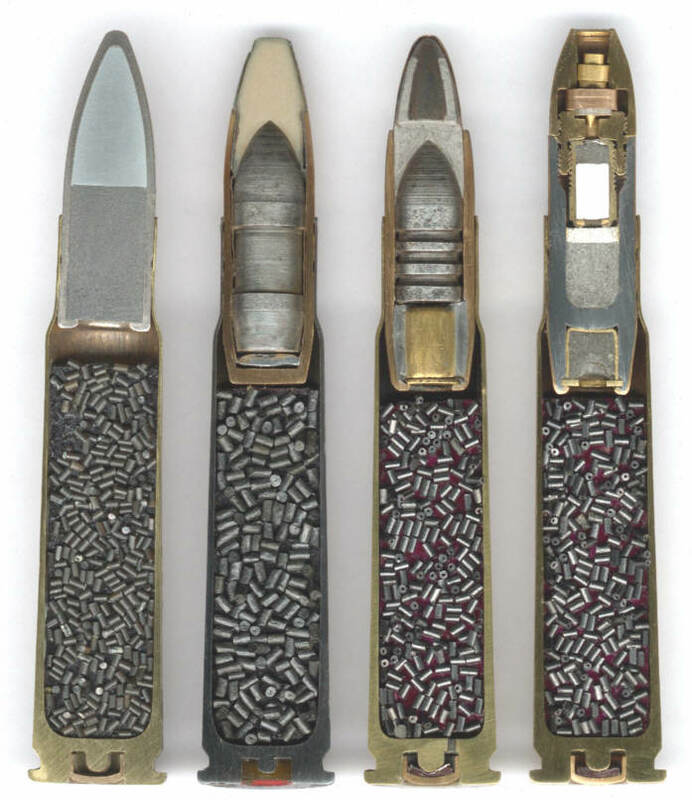 All of the bullets in British service were flat-based which limited their maximum ballistic range to 4,265 yards (3,900 m). They could achieve a maximum altitude of 9,500 feet (2,900 m). Of course, the effective ranges were very much less than this; they were probably in the region of 820 yards (750 m) against aircraft and 1,640 yards (1,500 m) against small surface targets. The elevation of 165.25 minutes required to achieve 2,000 yards (1,830 m) equals 2.75 degrees. The new Vickers .5 inch was offered in three different versions for the three services. 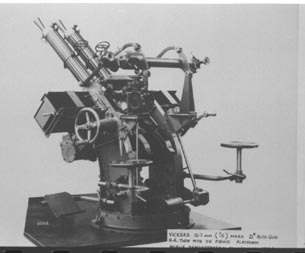 The army gun was water-cooled and fired at 450 rpm. The naval version was similar in appearance but had the rate of fire boosted to 700 rpm by the removal of the delay pawl which held the crank until the barrel returned to battery - stronger buffer springs were also fitted. The air-force version combined the 700 rpm rate of fire with an air-cooled barrel. 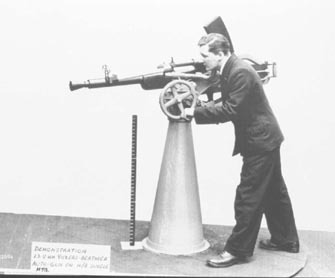 The army and naval versions had the traditional large-diameter fluted water-cooling jacket, just like the rifle-calibre version, but the aircraft gun looked radically different, with flat, tapered plates running each side of the barrel. The weight of the aircraft gun was 53 lbs (24 kg), the others weighed 57 lbs (26 kg) (without cooling water, which added 10 lbs - 4.5 kg). Barrel lengths were 31 inches (79 cm) or 62 calibres, overall lengths 47-53 inches(119-136 cm). The gun barrel recoiled a maximum of 1.25 inches (31.75 mm) and a recoil pull of 385 lbs (175 kg) was developed. The guns were belt-fed, using either a web belt (initially) or a disintegrating steel link type, with 100 rounds in the belt - a loaded belt weighed 24 lbs (10.9 kg). Mechanisms: Vickers rated superior, as consists of only two parts (lock and feed box) compared with three (bolt, feed box and recoil buffer). The Vickers lock takes only one-third the time to replace, the feed box is also quicker to replace as well as being more reliable, and the feed being driven by gun recoil has no ill effect on the operation of the lock. Rate of Fire: both can be adjusted up to 750 rpm, but the Vickers can be adjusted by means of a crank check lever which can be regulated during firing, while the Browning requires the back plate to be removed to adjust the recoil buffer. 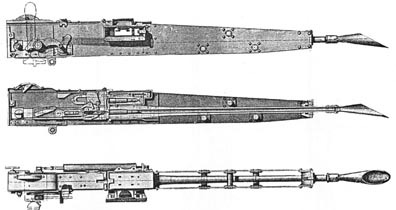 Fouling and grit: both guns performed satisfactorily, but it was noted that the Browning ended up with more grit in the mechanism due to it being more exposed by the opening of the gun casing. Also, after prolonged gun firing the Browning's mechanism was coated with black fouling while the Vickers' was clean. Control: in both guns, the vibration was too severe to keep them on target so shoulder stocks were recommended for accuracy. Belts and filling machines: neither web belt was found to be satisfactory. The Vickers belt was made using metal spacing strips and eyelets, which were inadequately secured, while the Browning's was stitched and could only be used two or three times. Both metal link belts were satisfactory. The Browning had filling machines for both types of belt (the metal belt filler was commended, the web one condemned), the Vickers had none. Reliability: it was noted that the Vickers was an early example and suffered some problems, but these were corrected with modified parts during the trials and it was then very reliable. The Browning was reliable at high rates of fire but less so at lower RoFs, especially at higher elevations. Any kink in the belt would cause a failure to feed. The Browning's casing fractured during the test. Wear and failure of parts - if any - are to minor parts that can be readily replaced. Care and maintenance is easier to the inexpert, on account of its less complicated recoil and buffer mechanisms. The mechanism and functioning of the gun requires less special or expert knowledge to obtain a good, reliable performance, and is more readily understood by the average seaman, who already receives training in the similar mechanism of the .303-inch gun. Readily converted to right or left gun. From a general technical point of view, it is the opinion that the fundamental principle of the mechanism and the action of the Vickers gun is superior to that of the Browning, and is more certain in its action generally. The .5-inch Vickers gun is therefore recommended for the Naval service in preference to the Browning gun." 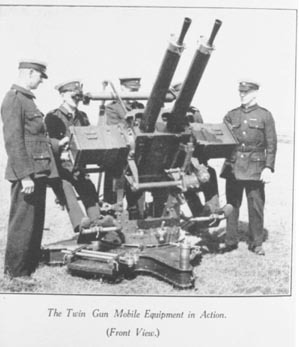 The RAF also evaluated the .5 inch Vickers and Browning guns. The results were inconclusive; the Browning was more powerful but was longer and heavier. It was concluded that the .303 inch version of the Vickers was almost as effective as the HMGs against the light, unarmoured aircraft structures of the time and it was much lighter as well as faster-firing. The RAF accordingly decided not to proceed with a heavy machine gun, while noting that any widespread adoption of armour for military aircraft would force a re-think. By the mid-1930s, when the increasing performance and toughness of aircraft began to cast doubt on the future of rifle-calibre guns, the RAF opted for the greater destructive power of a 20 mm cannon, choosing the French Hispano HS 404. A few American .5 inch Browning M2 guns were used late in the Second World War in applications for which the Hispano would have been too big and heavy, but apart from this no heavy machine guns were used by the RAF. The Vickers Class C is shown below left. The Vickers wasn't the only .5 inch gun considered by the RAF. BSA (Birmingham Small Arms) offered their Model 1924 gun for aircraft observers (shown below right). 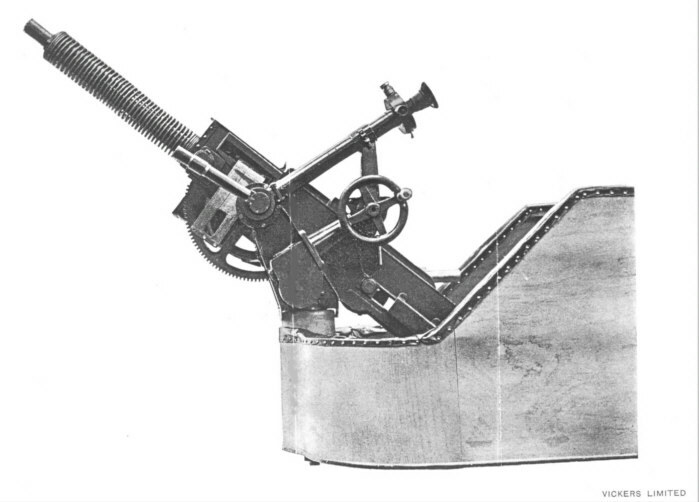 It was intended to be flexibly mounted so used a long-recoil mechanism to soften the recoil kick, and was fed by a pan magazine on top of the gun. Initially, this used BSA's own (very similar) ammunition but it was later slightly modified to use the Vickers 12.7x81 cartridge. The RAF rejected it as being too heavy, too slow-firing (only about 400 rpm) and having too small an ammunition capacity (37 rounds). The naval version of the Vickers .5 inch, designated the Mark III, was the most successful, with over 12,500 accepted for RN service.. 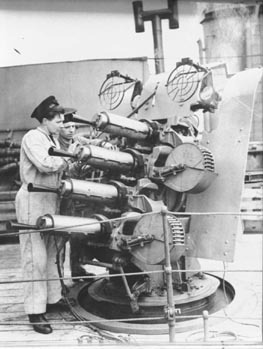 It was initially offered in a curious four-barrel mounting in which the guns were stacked vertically, which in 1939 was the RN's standard short-range AA equipment. 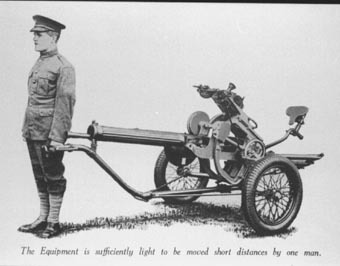 This was manually-operated, but later in the war a power-operated twin mounting (with side-by-side guns) was used in motor gun boats and similar craft. As an AA gun it soon proved insufficiently powerful and was gradually replaced by the 20 mm Oerlikon. China bought 19 examples of this gun. The four-barrel mounting had its guns adjusted to provide a spread of fire, amounting to 60 feet wide and 50 feet high at 1,000 yards (15-18 m at 915 m). The belts were wrapped around large drums which carried 200 rounds per gun. Vickers claimed that it could fire all 800 rounds in 20 seconds and could then be reloaded in a further 30 seconds. They also claimed, rather optimistically, that it "could deal with aircraft at ranges of 1,500 yards (1,370 m) and below." Accuracy: when fired from a fixed (test) barrel, the average size of a 20-round group must not exceed 12 inches at 500 yards (305 mm at 460 m). Armour penetration: 70% of rounds fired must perforate a 15-16 mm hard steel plate (440-480 Brinell) at 100 yards, normal impact. Perforation will be considered to have occurred when (a) daylight is visible through the plate, or (b) when the core, being left in the plate, projects beyond the back surface of the plate. The British Army only officially used its .5 inch Vickers in AFV mountings. The initial model was designated .5 inch Mark I but improvements were made before this was issued as the Mk II. Later, the Mk IV was introduced which had the same mounting dovetail as the .303 inch gun and had its RoF increased from 450 to 600 rpm. The Mark V was the finally improved, strengthened, AFV version and over 1,000 of these were made by 1940 (only just over 100 of the earlier models being manufactured). The Infantry Tank Mk 1 was equipped with one of these guns in a one-man turret, but apart from this the .5 inch was usually paired with a .303 inch Vickers in armoured cars and light tanks. Some units of the Long Range Desert Group "acquired" these guns and fitted them to pintle mountings on their 4x4 vehicles. They can be distinguished from the .303 inch version by the lack of the bulbous muzzle booster in front of the cooling jacket. Early in the Second World War both Vickers .303 inch and .5 inch guns were replaced in their AFV roles by two guns from Czechoslovakia, the 7.9 mm ZB vz/53 and 15 mm ZB vz/60. These were both known as "BESAs" in British service. On the left is a photo of the big 15 mm BESA on a curious spring-wheel carriage. Vickers may not have had much success in selling their big gun to the RAF but it attracted foreign interest. 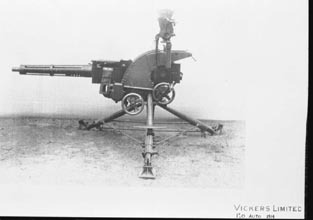 The British Government didn't like Vickers selling their latest equipment abroad so Vickers slightly modified the cartridge case to make it semi-rimmed, giving the designation 12.7x81SR; this variant being developed as early as 1923. Vickers knew the cartridge as the .5"V/565 as their standard bullet for it weighed 565 grains (36.5 grams) with a 2,490 fps (760 m/s) muzzle velocity. Bullet types developed for this cartridge included Ball, AP, AP-T, 'Flame Tracer', and 'Smoke Tracer / Incendiary' (similar to the Buckingham type used in the .303 B Mk IV). Some 65 Vickers aircraft guns in this calibre were bought by Japan and 49 by Siam (Thailand) but it is not clear whether or not any service use was made of them. The Italians also used the cartridge in their own 12.7 mm Breda-SAFAT and Scotti aircraft guns. The short-recoil Breda-SAFAT was not a sparkling performer, weighing 64 lbs (29 kg) and firing at 700 rpm, but it was the standard Italian fixed aircraft gun at the start of the Second World War, two synchronised guns normally being mounted in the cowling of single-engined fighters. The gas/blowback Scotti fired no faster, but did weigh only 51 lbs (23 kg). It seemed to be more highly regarded, but was primarily, if not solely, used in flexible mountings. 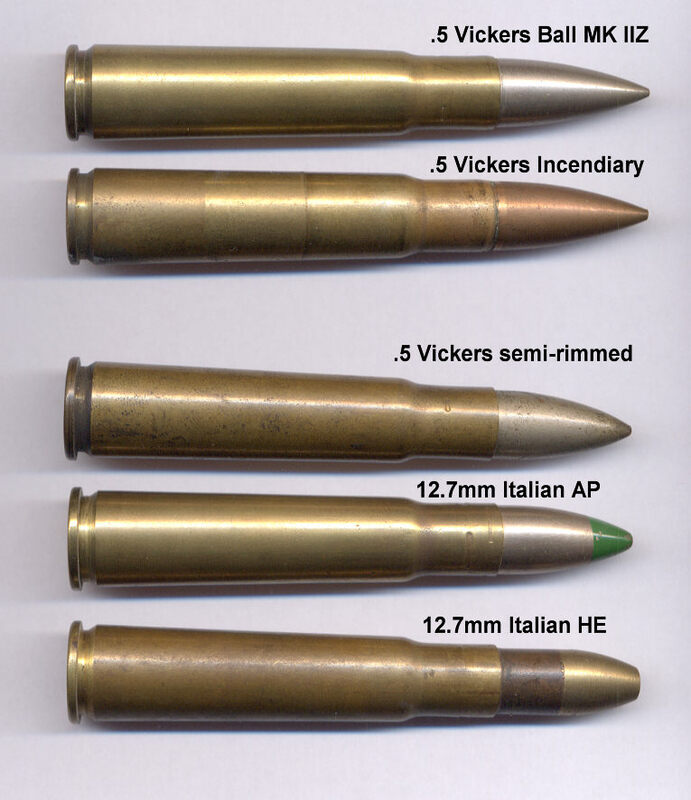 The Italians developed various different loadings for the semi-rimmed cartridge, including Tracer, AP, API, API-T, I-T, and (famously) HE and HEI-T. The HE contained around 12.3 grains (0.8 g) of Penthrite wax. The Japanese Army became interested in the Breda-SAFAT and in particular its explosive shells, and considered adopting the gun. In the end they did adopt the cartridge but developed their own, superior, aircraft gun, the 12.7 mm Ho-103 (based on a smaller version of the .50 Browning M2) to use it. This fired at 900 rpm and weighed only 48 lbs (22 kg). They also developed their own HE ammunition as well as using the Italian designs. Some British and Italian-produced ammunition is shown on the right. Sectioned views of some of the Italian cartridges are shown below (courtesy of Christian Koll of the russianammo.com site). 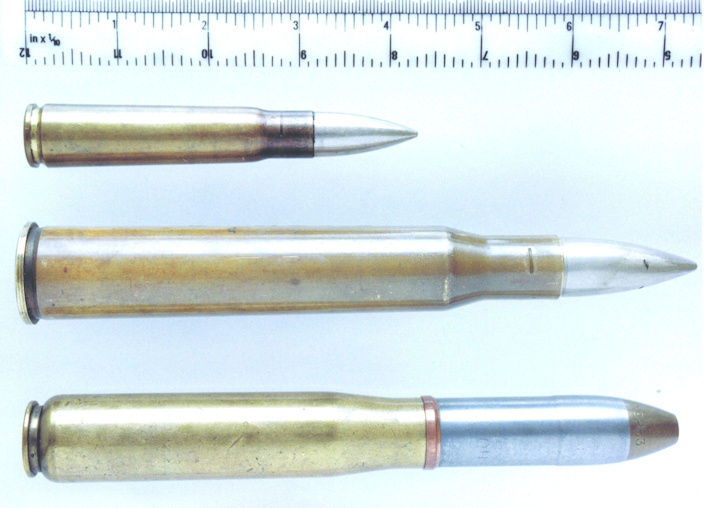 These are, from left to right, Ball (aluminium tip), API, API-T and HEI-T. The Italian fighters and their 12.7 mm Breda-SAFAT guns were also adopted by Spain and Hungary, who made their own ammunition for it. The Hungarians also used the 12.7x81SR cartridge in the HMG version of their fascinating Gebauer GKM engine-driven twin-barrel gun, which was fitted to the Hejja II (licence-built Reggiane Re 2000). Much less well known is the Vickers .5 inch Class D or HV (for high velocity), also developed in the mid-1920s. This was basically a lengthened version of the usual .5 inch gun, designed around a much bigger and more powerful 12.7x120SR cartridge, known as the V/664 (with 43 gram flat-based bullets) or V/690 (45 gram boat-tailed - streamlined - bullets); the latter became standard) and achieving an impressive muzzle velocity of 3,040 fps (927 m/s). Bullet types developed for both the V/664 and V/690 were Ball, AP, AP-T, Flame Tracer, and Smoke Tracer / Incendiary. Weight of the V/690 cartridge was 135 g and a belt of 100 rounds weighed 33.5 lbs (15.2 kg). Maximum range claimed was 7,000 yards (6,400 m) with a vertical altitude of 15,600 feet (4,750 m) but, as with the 12.7x81, effective ranges would have been far less; probably 1,100 yards (1,000 m) in AA fire and double that against ground targets. The gun barrel was water-cooled as usual and rate of fire was 350-450 rpm. Gun weight was 101 lbs (46 kg), or 122 lbs with water (55.3 kg) and it was noticeably longer than the compact Class B, with a barrel length of 45 inches (114 cm) and an overall length of nearly six feet (179 cm). 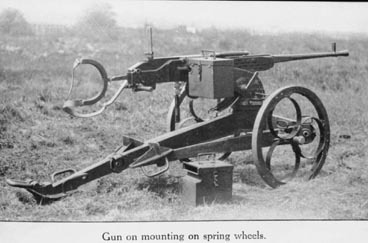 This was offered primarily as an AA gun in a twin mounting, or as an AT gun in a single mounting, although both mountings could be used in either role. The single mounting, complete with water, weighed 623 lbs (283 kg) while the twin weighed just over a ton (1,032 kg) in action. Photos of the single and twin-barrel Class D mountings are shown below. Despite various experiments (including installing a twin mounting on a Vickers Light Tank Mk 1A) the Class D was never fielded by Britain. It did achieve some very limited foreign sales; Siam bought 24, China 20 and Japan 48. Rather less information has survived about other Vickers projects; the 1 inch, 25.4mm and 1 pdr Mk III guns, the 13.2mm Vickers-Berthier and the .661 inch naval AA gun. 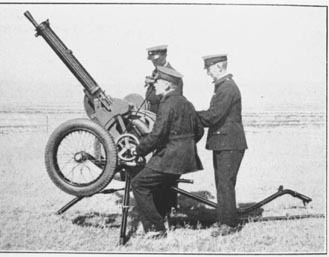 The 1 inch gun was developed before the First World War, apparently for both aircraft and ground use. It was made under licence by Terni in Italy, who in the early 1920s sold some to the Swedish navy for installation as AA guns in four of their submarines, as well as (at least) one surface vessel: the 'Clas Fleming' minelayer which carried three 'Vickers 25mm' guns in the 1920s. A photo exists which appears to show that at least one of these guns was fitted to an Italian bomber in WW1. It used a long-recoil variant of the Maxim action, as did a scaled-up version, the 1 pdr Mark III in 37x69R calibre, which saw brief service with the RFC as an aircraft gun in WW1 (it is sometimes confused with the much larger 1 pdr "Pom pom"). The improved Mk V version reportedly saw experimental use postwar in airships. Two views of different versions of the Vickers 1 inch gun are shown below. 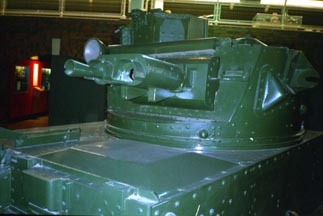 The 1 inch Vickers should not be confused with the 25.4mm Vickers which was a mid-1930s naval AA gun. Details of the gun and its ammunition are available HERE. The photo on the left shows three rare Vickers cartridges for comparison: the .50 HV, the 1 inch (25x87R) and the 25.4mm (25x189). 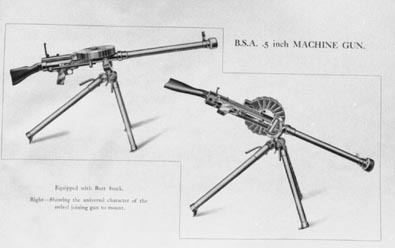 Nothing is known about the 13.2 mm Vickers-Berthier shown on the right, except that the Berthier mechanism was designed by a Frenchman and also used in the .303 inch Vickers K or GO (gas-operated) aircraft gun. It is presumed that the gun was designed around the usual 13.2x99 Hotchkiss cartridge which was manufactured in the UK. No use for the gun is known. 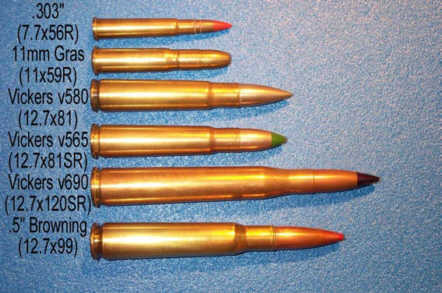 Shown on the left is a photo of the various Vickers .5 inch and related cartridges, with the .5" Browning for comparison. Finally, the big .661 inch Vickers naval AA gun. This was designed in the mid-1930s as a replacement for the .5 inch gun, but development was stopped when it was decided to buy the 20 mm Oerlikon instead. The gun was belt-fed, water-cooled, fired at 300 rpm and came in a six-barrel mounting based on that of the quad 2pr pom-pom. Of the gun, only some faint drawings seem to have survived, but some examples of the massive 16.8x149SR cartridge do exist. It fired an 85 g projectile at 1,000 m/s. The photo on the left (courtesy of Tony Edwards) shows the .661" cartridge (centre) with the .5" Vickers V580 above and the 20x110RB Oerlikon below. Thanks are due to the Curator and Librarian of the Ministry of Defence Pattern Room, which supplied the black and white photos used to illustrate this article as well as documentation concerning the guns. More information about the Vickers, Breda-SAFAT, Scotti, Ho-103 and BESA guns and ammunition mentioned in this article are included in the author's book: Rapid Fire - The Development of Automatic Cannon, Heavy Machine Guns and their Ammunition for Armies, Navies and Air Forces. For further information about the development of the Vickers cartridges, see: Labbett, P. British Small Arms Ammunition 1864-1938. Privately published (UK, 1993). Other references used were 'British Made .5 inch and 13 mm Machine Gun Ammunition, not for British Service' by Labbett and Brown, 'The Grand Old Lady of No-Man's Land' by Dolf Goldsmith and 'Military Rifle and Machine Gun Cartridges' by Jean Huon.